SEA OF THIEVES is the latest Microsfot title, a MMORPG set in a pirate world where we can do all the typical pirate actions: Pirate and plunder other ships, go out in search of secret islands full of treasures, create a crew and fight against other pirates in intense PVP battles and endless other things. The game is available for both Xbox One and PC through Microsoft's backward compatibility system, so this version of the DLC is compatible for both PC and Xbox One. Remember that for PC it is necessary to have the Windows 10 operating system installed. This DLC will grant us the following: Mercenary Pistol, Mercenary Cutlass, Mercenary Compass and Mercenary Outfit. The Mercenary Pack will automatically download after you redeem the code in your Microsoft account and install the game. Once redeemed, items will appear in the game, but not in your inventory, so you'll need to find them. We will need to find the specific merchant who will have all the bonus items available. 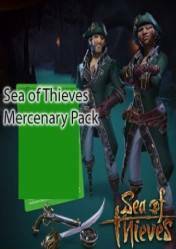 There are no comments yet about SEA OF THIEVES MERCENARY PACK DLC. You can be the first one!